Our machine sweeps, scrubs, and extracts all in one pass. Cylinder brushes lift the dirt and debris from the cement seams. 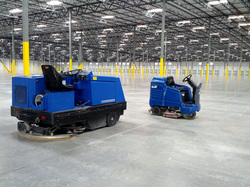 Floors are clean and dry, ready for immediate use. Call today, we will be there tomorrow. Sooner if you need us! We clean skylights, steam clean / refurbish restrooms, polish cement floors and seal expansion seams, remove parking lot debris, and more. We are your One-Stop-Shop.  25,000 to 49,000 at $0.02 per sq. ft.
 50,000 & above at $0.01 per sq. ft.
 Pallets, sand bags, pipes, wood, etc.